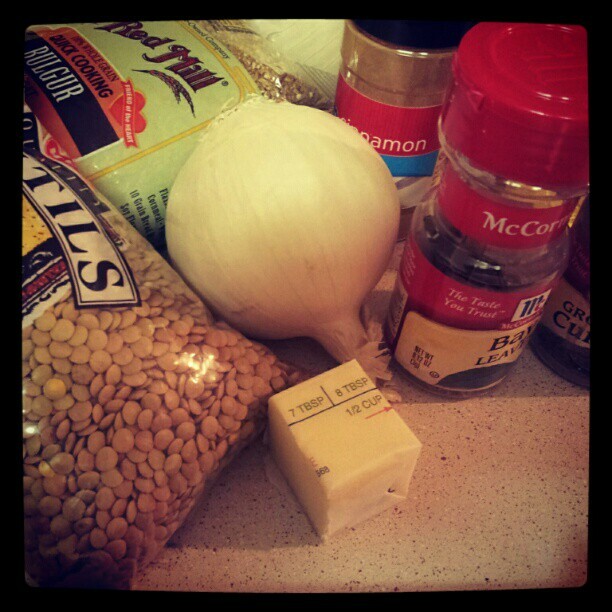 If you follow Kitchen Concoctions along on Twitter (and of course I think you should! ), you might have ‘seen’ a little more of me two Saturdays ago when I participated in a live Cook, Eat, and Tweet. 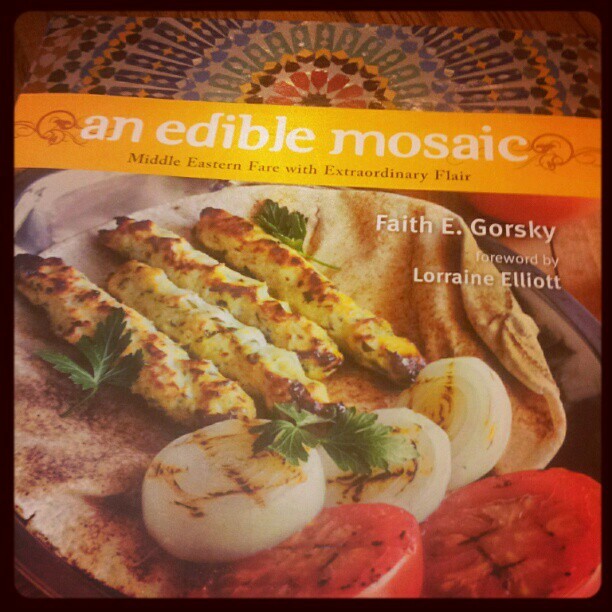 This event was part of the cookbook tour I have been participating in since December for the new cookbook An Edible Mosaic: Middle Eastern Fare with Extraordinary Flair, by fellow blogger and cookbook author, Faith Gorsky. 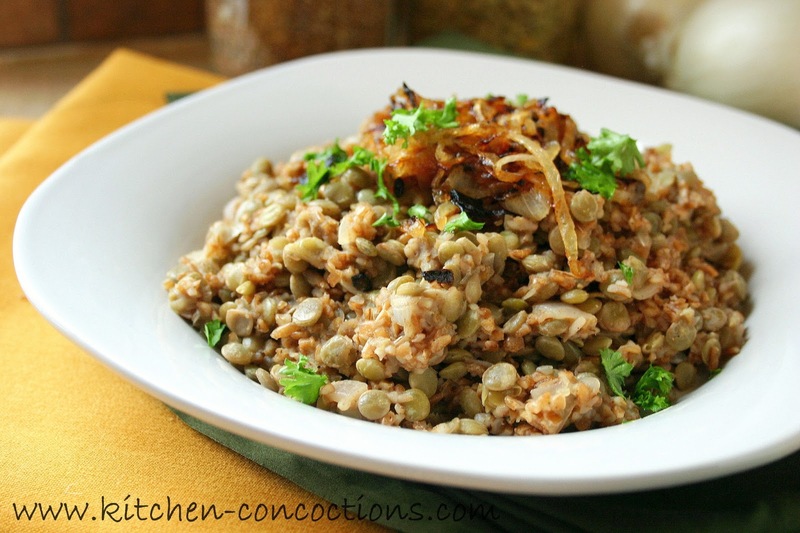 During this this live Twitter event the five other bloggers participating in the cookbook tour and I, as well as Faith and anyone else who wanted to ‘cook and tweet’ along; all simultaneously cooked Lentil and Bulgur Pilaf with Caramelized Onion (recipe below) from Faith’s cookbook. This was such a fun event! It was neat hearing and seeing (through Twitter pics and Instagram) everyone’s progress as we all cooked the same dish. This event was interesting on another level as each of the bloggers, not to mention Faith, all provided great tips and cooking advice along the way! Even though cooking and tweeting at the same time was a challenge, it was great fun and I hope to do it again soon! In case you missed all the fun, you can still create this simple yet filling vegetarian meal; not to mention other great recipes from An Edible Mosaic: Middle Eastern Fare with Extraordinary Flair. Sort through the lentils to remove any small stones or pieces of dirt, and then rinse with cold water in a colander. Bring the rinsed lentils and the water to a boil in a lidded medium saucepan. Cover the saucepan, turn the heat down to a simmer, and cook until the lentils are tender but not mushy, about 20 to 30 minutes, stirring occasionally and adding more water as necessary so that they’re always immersed; strain. While the lentils cook, heat the oil and the butter in a large skillet over moderately-high heat; add the onion and sauté until completely softened but not yet browned, about 10 minutes, stirring occasionally. 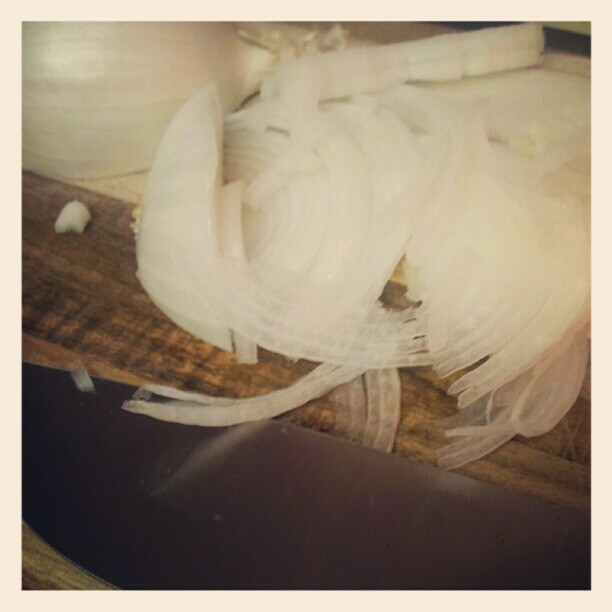 Transfer half the onion to a small bowl and set aside. Continue cooking the remaining onion until deep caramel in color, about 5 to 10 minutes, stirring occasionally and adding a splash of water as necessary if the onion starts to get too dark. Set aside. Put half a kettle of water on to boil. Transfer the sautéed onion (not the caramelized onion) to a medium saucepan. Add the bay leaf, cardamom, clove, cumin, cinnamon, salt, and pepper and cook 1 minute. Add the bulgur and cook 1 minute more, stirring constantly. Add the boiling water, turn the heat up to high, and bring to a rolling boil. Give the bulgur a stir, then cover the saucepan, turn the heat down to very low, and cook until tender, about 10 minutes (do not open the lid during this time). 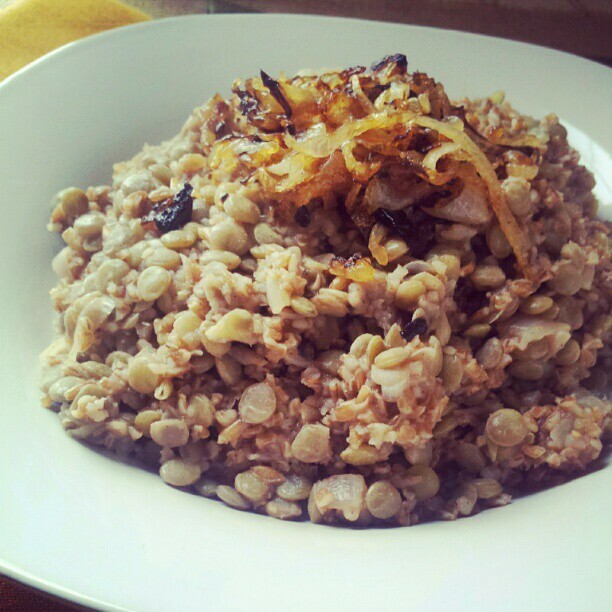 Turn the heat off and let the bulgur sit 10 minutes, then ﬂuff with a fork and gently stir in the lentils. Taste and add additional salt, pepper, and olive oil if desired. 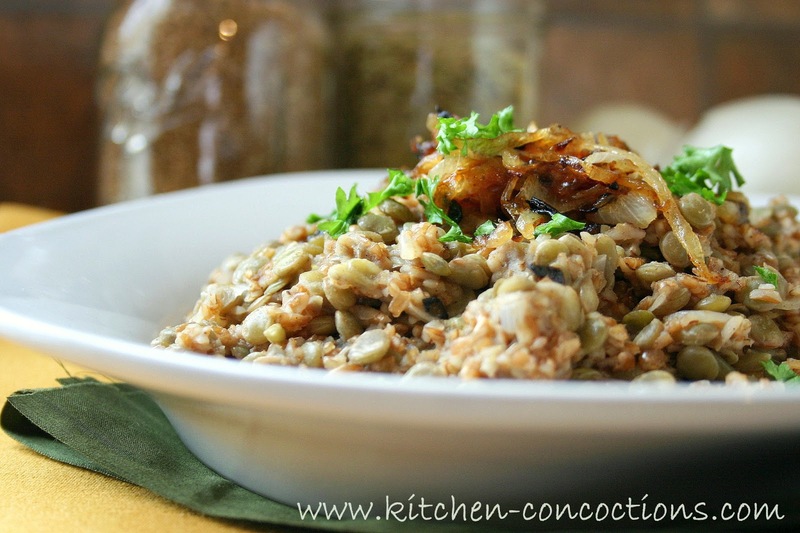 Transfer to a serving dish and top with the caramelized onion. Serve with plain yogurt to spoon on top, if using. This was so much fun! And now I am craving mujadarra again!